OSHA’s analysis shows that where effective safety and health management is practiced, injury and illness rates are significantly less than rates at comparable worksites where safety and health management is weak or non-existent. Hence, before he leaves office, it is no surprise that Dr. Michaels has dusted off and, at minimum, put a new coat of paint on OSHA’s old Safety and Health Program Management Guidelines. Originally published in 1989, the revised Safety and Health Program Guidelines issued last month have been updated to reflect modern technology and work practices, and also to incorporate a number of other OSHA programs and initiatives, such as the Agency’s VPP (Voluntary Protection Program) and SHARP (Safety and Health Achievement Recognition Program). Ironically, in promoting Safety and Health Program Management in these guidelines, OSHA touts the success of employers working with these compliance assistance programs, which require written programs, but simultaneously OSHA has been taking steps throughout this Administration to undermine those programs. The proposed updated guidelines also provide more substance around the role of employee involvement in the development and implementation of health and safety systems. Specifically, the revised guidelines provide much more detail about how employers should collaborate with employees in establishing health and safety management plans. OSHA believes that they will be especially useful for small to mid-sized businesses and in multi-employer situations. Coordination and communication on multi-employer worksites. 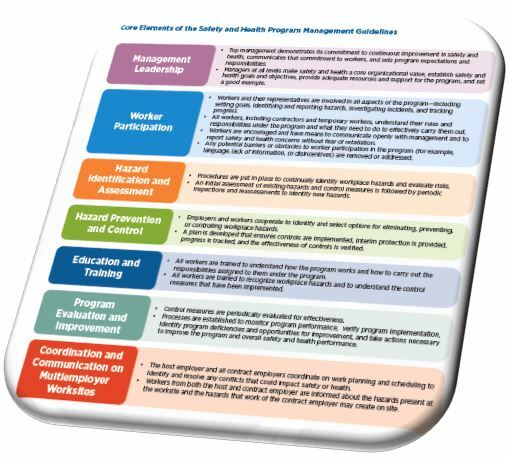 Under each core element, there are several action items that employers are encouraged to take to establish, implement, maintain and improve their safety and health programs. OSHA then lists specific steps to accomplish each action item. One significant change from the 1989 guidelines is the core element on coordination and communication on multi-employer worksites. This section specifically recognizes a common issue that has become an OSHA regulatory and enforcement priority in recent years. To address this issue. OSHA identifies steps that host employers and contractors, subcontractors and temporary staffing agencies should take to establish mechanisms to coordinate their efforts and communicate information to prevent and control injuries and illnesses, and that workers are afforded equal protection against hazards. What is your experience with safety and health programs or management systems? What factors made them succeed? How can OSHA’s guidelines be an instrument of change in the culture of the U.S. workplace? Dr. Michaels also asked stakeholders if OSHA needs one broad document that addresses all employers or different guidelines specific to different types of employers or industries. Several stakeholders in attendance, mostly employee-based association and union representatives, expressed their support for the guidelines while highlighting the need for further clarification around several areas, such as the guidelines for multi-employer worksites. Some stakeholders commented that the guidelines are still rooted in the old industrial workplace model and needed to be broadened to address a wider range of issues facing many employers today, such as workplace violence and short-staffing. Others had concerns that the guidelines do not take into account the overall makeup and organization of an employer’s workforce in providing guidance on what health and safety measures are necessary, applicable, and/or advisable. Given these concerns, we expect OSHA seeks and provides specific examples of H&S programs that employers in various industries are successfully implementing. OSHA’s guidelines on multi-employer worksites was highlighted by many stakeholders as being one of the most important issues addressed in the guidelines due to the lack of clear direction regarding who incurs the varying responsibilities and risks associated with multi-employer worksites. As a result, we can expect that this will be heavily discussed in several of the comments that OSHA receives, and we expect to see the proposed guidelines on multi-employer worksites to be bolstered in the final draft. While the outline and style of the final guidelines issued by OSHA will more or less remain the same, OSHA will likely add more examples of effective programs and further explain certain core elements that are somewhat vague in the current proposal, such as the proposed guidelines on multi-employer worksites. Given the concerns about different industries and the lack of consideration of an employer’s workforce, OSHA may consider creating industry specific safety and health management guidelines. Finally, OSHA does not seem to have a clear plan for how it will promote the guidelines. Dr. Michaels explained that he hoped the stakeholders in attendance would be the ones to promote the guidelines. Many stakeholders discussed the importance of selling these ideas to management and convincing them of its utility. Dr. Michaels wants to align with trade associations and industry leaders in creating innovative ways of promoting safety and health programs to management. Further information about the proposed guidelines can be found on OSHA’s webpage dedicated to the proposed Safety and Health Program Management Guidelines. Interested parties may submit a comment to OSHA prior to the expiration of the 90-day comment period on February 15, 2016 at http://www.regulations.gov/, using OSHA ID number: OSHA-2015-0018-0003. Contact us if you have questions about the guidelines or if you would like to get involved in the public comment process.